Used to represent evolution of the number of documents along the time (so, this field is often a publication year, or anything indicating a point in time). Possible configuration: size, and color. If you want to superimpose a new series of values to the one already displayed in columns (but as a line), you can use the overlay property of an histogram. You have to indicate a label and a flying array. 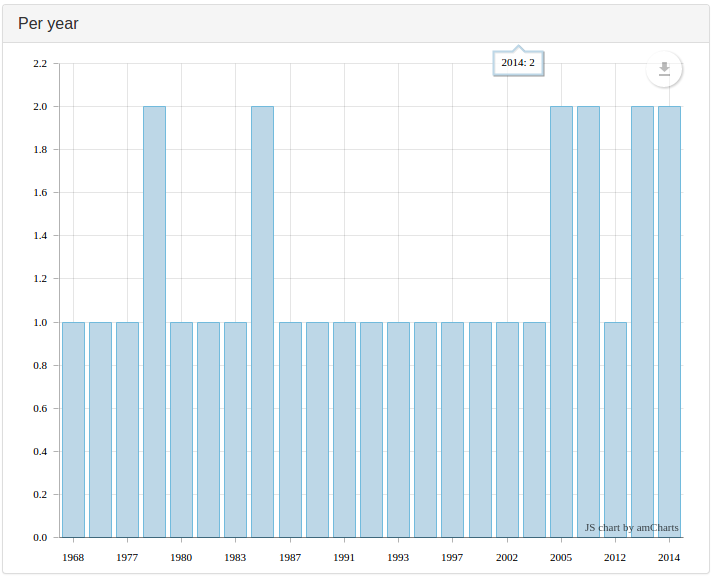 Example: to display an histogram the number of documents (publications) per year, overlayed by a line containing the citations per year. overlay has a color option, if you don't like the default color for the line. Warning: using facets with an overlay (which is computed from corpusFields) is not a good idea: the selected facets will not modify the chart, as other chart types do. The firstOnly property is here to prevent the URL to return a data containing an array containing an array with only one element, which the chart won't interpret correctly. If you don't see anything on the chart, try inverting the value of firstOnly (false by default). "compute": "citations / value / globalCitation"